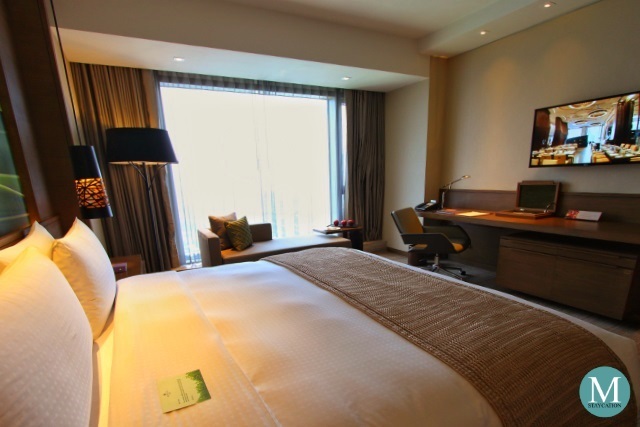 The Superior Room and the Deluxe Room are the lead-in guestroom categories of Marco Polo Ortigas Manila. 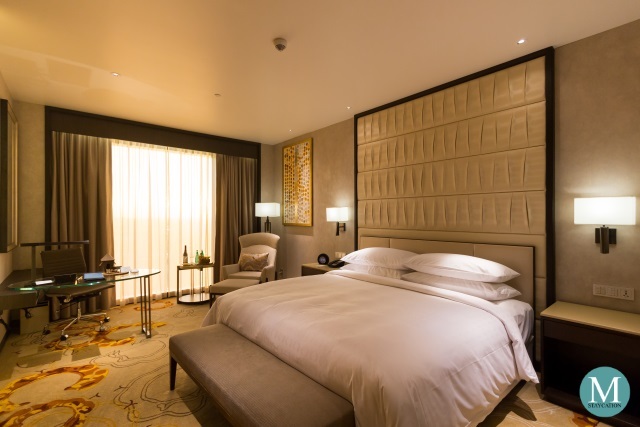 While the Deluxe Room is a notch higher than the Superior Room, both measure at 38 square meters and are basically identical in terms of room amenities. The difference lies on the view from the room's window. 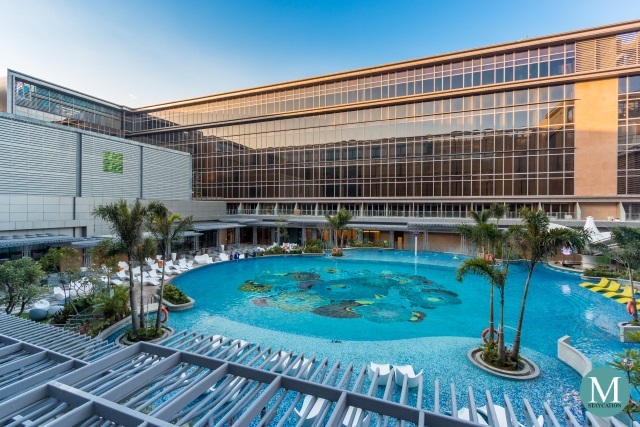 The Superior Rooms are located facing the east side of the building with a view of the Sierra Madre mountain range while the Deluxe Rooms are located on the west side of the building with a city view of the Ortigas Central Business District. The hotel seems to give more premium to the "quieter" Ortigas-side but I personally prefer the view from the Sierra Madre-side. Nonetheless, the difference isn't really that significant. The Superior Room and the Deluxe Room come in two bed configurations: a king-bed configuration and a twin-bed configuration. These luxuriously spacious rooms can comfortably accommodate up to two persons which make them perfect for solo staycationers, couples or parents with a young child. 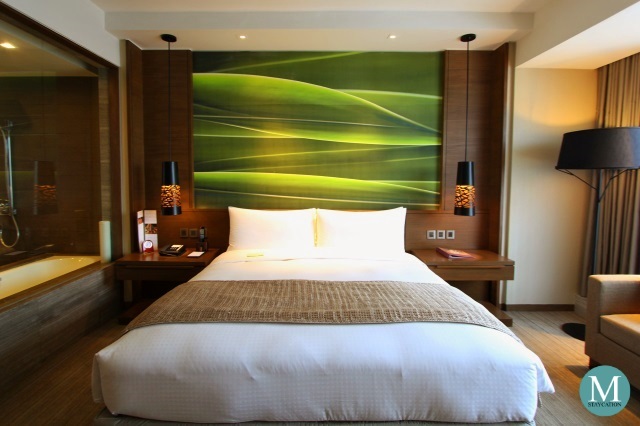 The Superior Room and the Deluxe Room feature a simple yet elegant design that highlights a lot of wood and marbles, and coupled with high-end and state-of-the-art amenities. 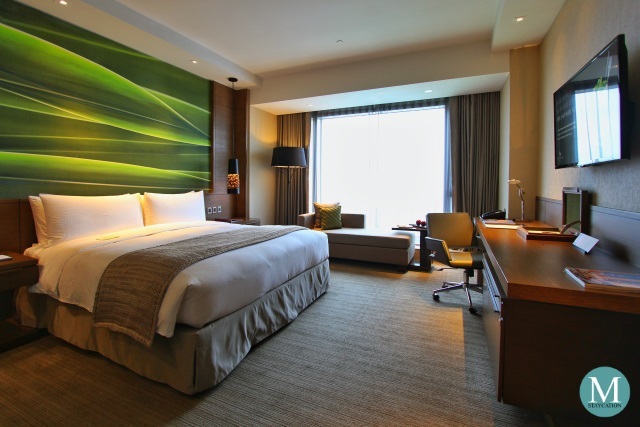 Marco Polo Ortigas Manila offers some of the most comfortable beds in Metro Manila, complete with high thread-count linens and premium goose down feather topper. The guestroom has a comfortable seating area with a movable side table. 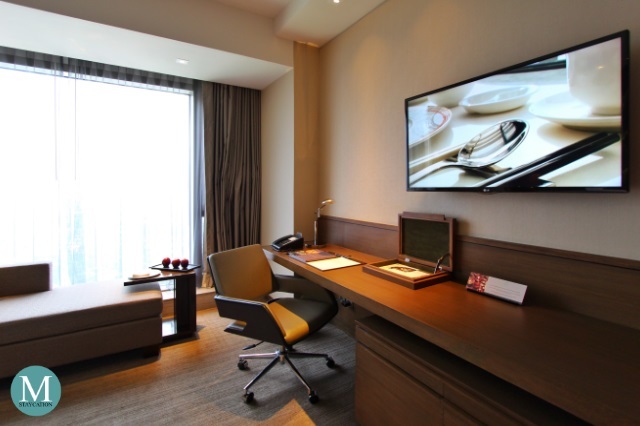 The executive desk serves as a work area complete with a multi-docking device with Bluetooth technology and complimentary high-speed WiFi Internet connection. The LCD TV features both local and international cable channels. 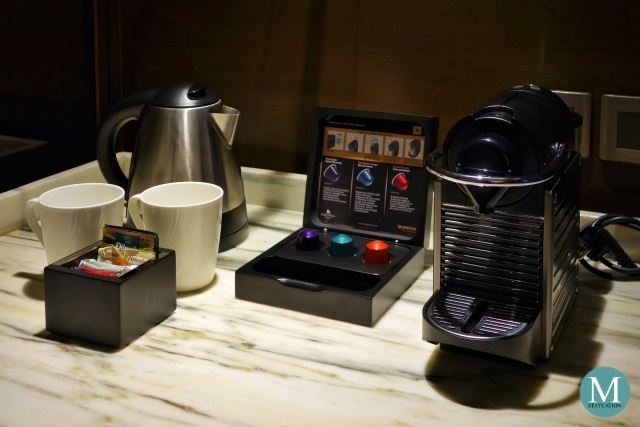 Marco Polo Ortigas Manila takes pride as the only hotel in Metro Manila that provides a Nespresso coffee machine in all of its rooms. Being a coffee lover myself, I consider the Nespresso machine as one of the highlights of the rooms. Tea lovers also get their fair share of premium in-room amenities with the complimentary Dilmah-branded tea bags. 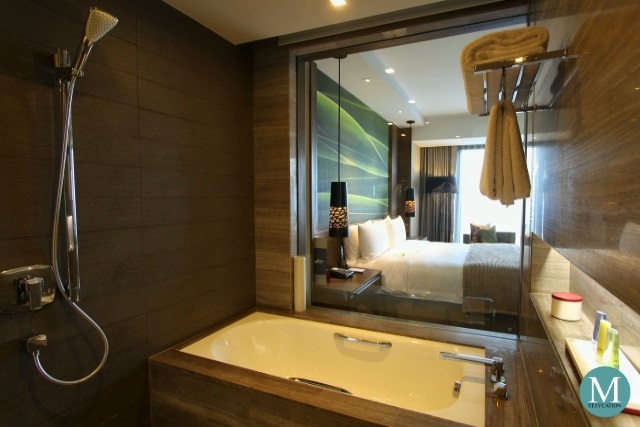 Marco Polo Ortigas Manila is primarily a business hotel and business travelers will surely be happy to know that all guestrooms and suites are provided with a spacious closet complete with an iron and ironing board. 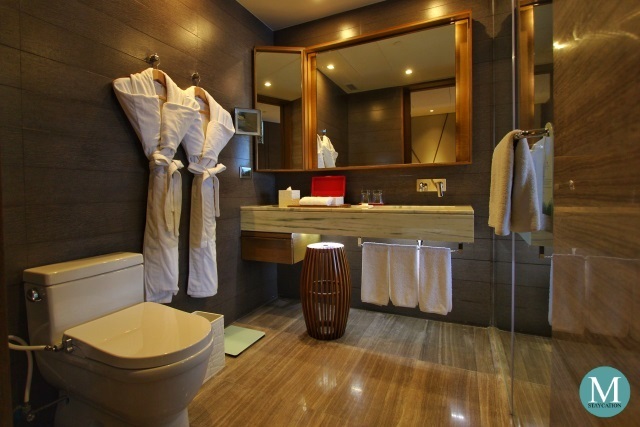 Equally spacious is the en suite bathroom which is beautifully designed with marbles and wood. The bathroom features a single sink, a separate shower area and a deep soaking marble bathtub. A clear glasswall separates the sleeping area to the bathroom. For privacy, you can simply draw the rolling blind inside the bathroom. Hot and cold water are available through the sink, the handheld showerhead, the rainshower showerhead, and the bathtub. Water pressure is consistently strong. Clean and high quality cotton towels are provided including face towels, hand towels, foot towels, bathing towels, as well as bath robes. 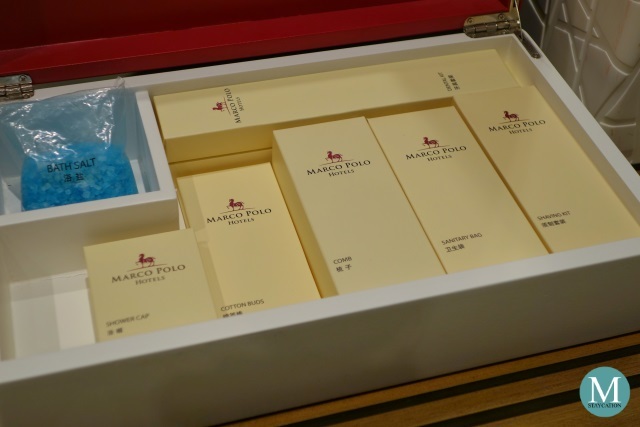 Marco Polo Ortigas Manila also supplies a wide selection of body and bath amenities. Next to the sink is a box containing shower caps, cotton buds, combs, sanitary bags, a shaving kit, dental kits and a pack of bath salt. 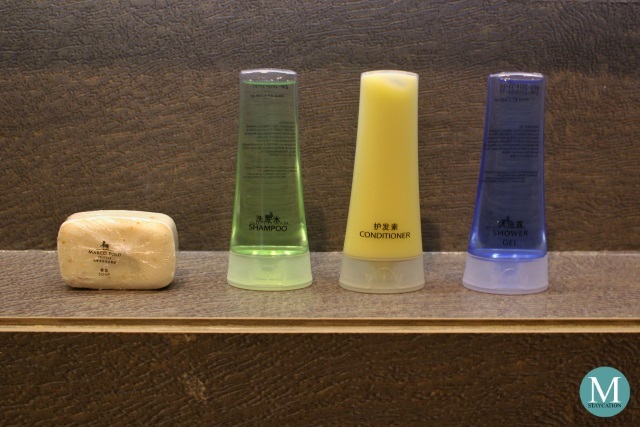 Marco Polo branded toiletries including soap, shower gel, shampoo and conditioner are also provided. 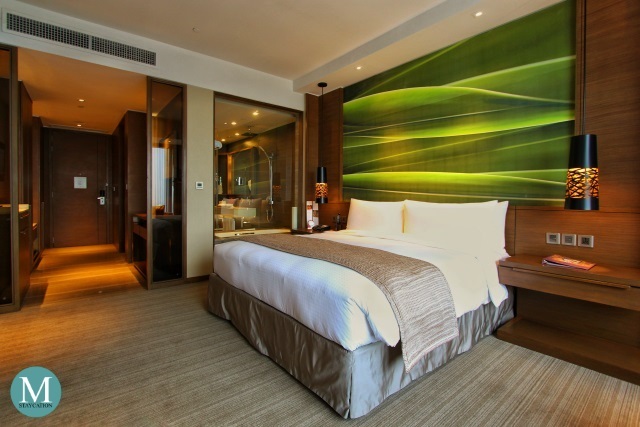 Marco Polo Ortigas Manila offers some of the most affordable luxury hotel accommodations in Metro Manila. 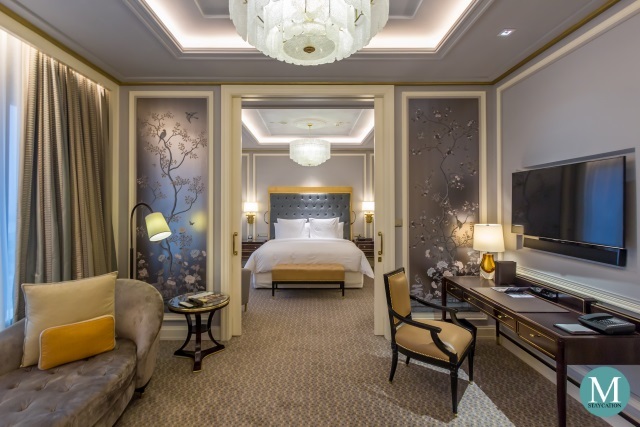 If you are looking for a quick escape in the city by indulging in a luxurious staycation, we recommend that you book a Superior Room or a Deluxe Room at Marco Polo Ortigas Manila.